Renovate or reconstruct the opening of your existing garage. Convert two single width openings to a double width opening. Reconstruct arches to a right angle opening. Increase the height and/or width of an existing opening. Change the colour of your garage door if you have a faded garage door or you don’t like the existing colour with a spray-on vinyl wrap in any colour. Double arches are now dated and restrict the drive-through width and height required for late model 4WD and SUV vehicles. We can remove garage pillars, mullions between roller doors, square off and/or remove arches to increase the drive-through width and height. We work with a registered builder for all your reconstruction work. Contact Garage Upgrades for a quote. 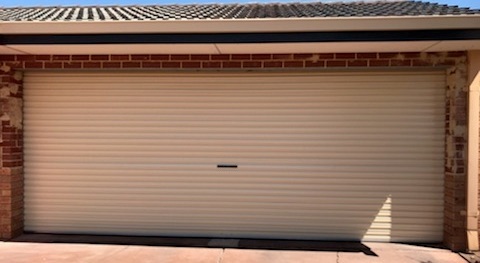 AFTER: A double width garage door. Original brickwork to be rendered. There are now many free visualisation tools available to assist you in designing and changing the look of your house and garage doors. All you need is a photo of the front of your house! They are relatively simple to use or if you prefer, email us a photo and we would be more than happy to provide you with some ideas. Got a faded garage door? Want to change the colour of your garage door? If it is in good working order, but the colour is faded, dated, or doesn’t go with the look of your house, why not change the colour? Consider a vinyl wrap in any colour. It is a quick and cost effective option to consider. Any colour, multiple finishes, cost effective, 8 coats ensure it can be easily removed in the future. Suitable for sectional doors only. We will need to dismantle your door, take it offsite and reinstall it in 48 hours.